For a busy high-end restaurant in Ontario, the recipe for success includes a farm-fresh menu, impeccable service and a gorgeous al fresco dining patio, resplendent with rich teak wooden tables and benches. 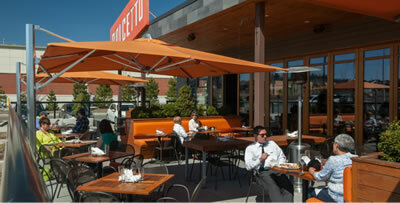 Named one of Open Table’s Top 100 outdoor dining experiences in Canada in 2017, Dolcetto restaurant in London, Ontario, is an elegant, bustling bistro that honors the Italian way of life. The restaurant, which opened in 2012, artfully creates a space that celebrates family and community in a warm and welcoming dining experience for customers. To invoke a European flare, the walls in the restaurant open to the gorgeous patio, resplendent with rich teak tables and cushioned wooden benches. The effect not only brings the outdoors in, but it also nearly doubles the seating capacity during warm weather months. The owners, brothers Dino and Bob DiFruscia – who are established restauranteurs and have been in the business for 37 years – know you don’t succeed in this industry by doing anything half-baked. Dino calls Sansin Resolution – a marine-grade wood stain they chose for Dolcetto’s stylish wooden tables and banquettes – the most durable product he’s seen in over three decades of restaurant experience. Initially formulated for harsh and varied marine environments, Resolution is a two-part, environmentally friendly, NGR (non-grain raising) high-performance wood finish system. Resolution is tougher, more beautiful and longer-lasting than varnish, delivering brilliant clarity and low-maintenance performance. Its high-solids content and fast cure times make it easy to apply and allow projects to get completed quickly – important in the restaurant industry – and others – where time is money. Resolution I is the primer step. It is a high-solids finish that penetrates and fills the wood grain with deep UV and moisture protection. Resolution II is the second step. It is a crystal-clear, low VOC finish available in gloss or satin finishes.